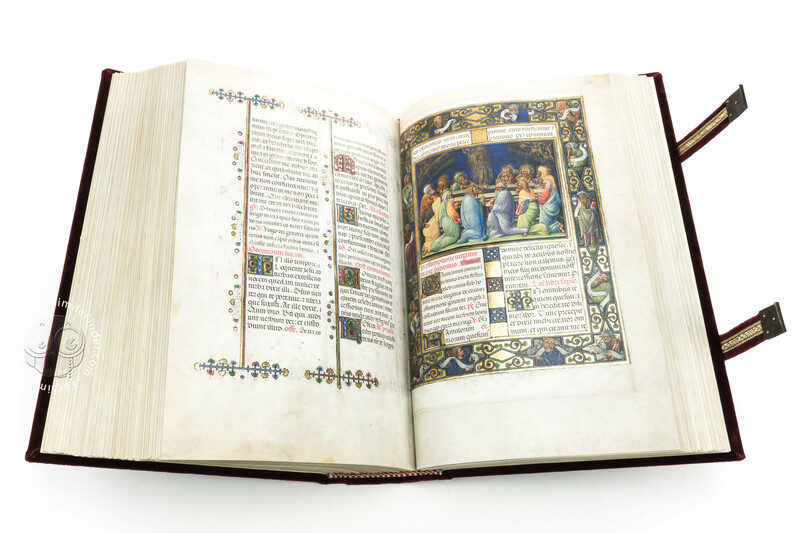 The Missal of Barbara of Brandenburg was created between 1442 and 1465, when the most prominent artists working in Mantua were Leon Battista Alberti, Pisanello and Vittorino da Feltre. 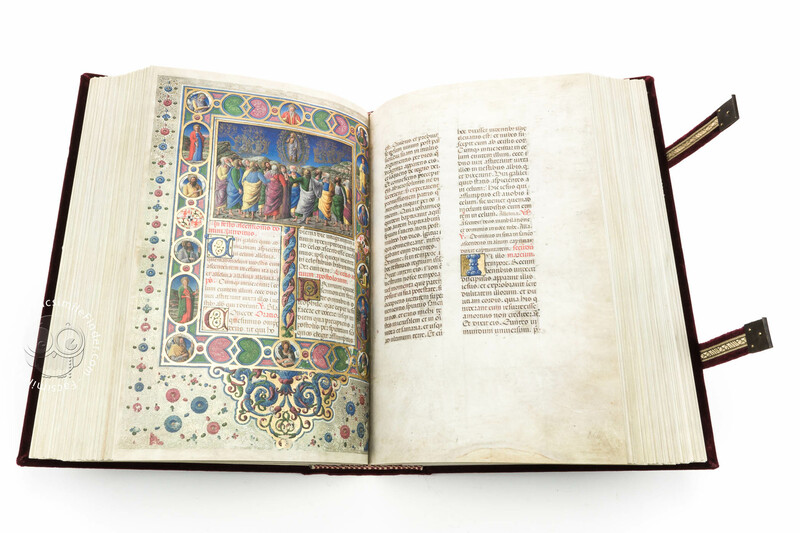 Other important artists of the time also included Andrea Mantegna, Girolamo da Cremona and Luca Fancelli. 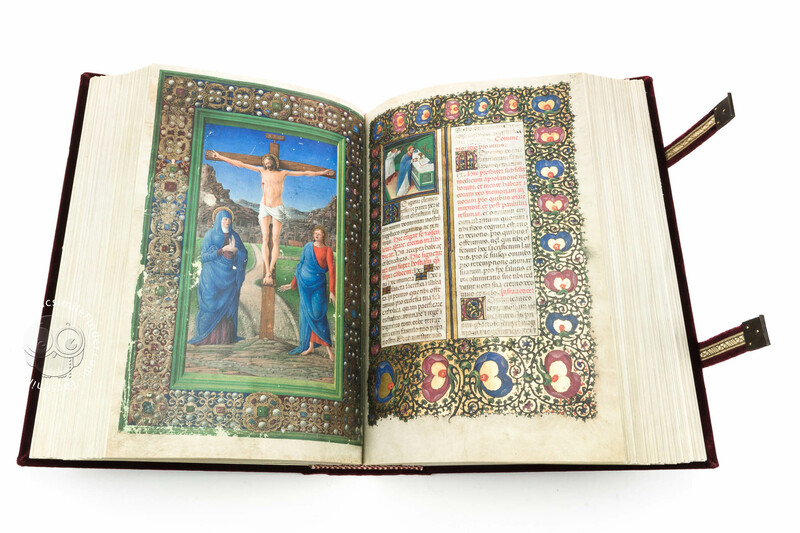 The Missal of Mantua was commissioned in 1442 by Gian Lucido Gonzaga to Belbello da Pavia, considered the most important representative of Late Gothic miniatures and noted for the renowned Offiziolo Alfonsino. When the patron passed away (1448), the decorative works by Belbello and the writings (assigned to Pietro Paolo Marono, the calligrapher of the Bible of Borso d’Este) were subjected to various interruptions and for almost a decade the Missal remained incomplete. 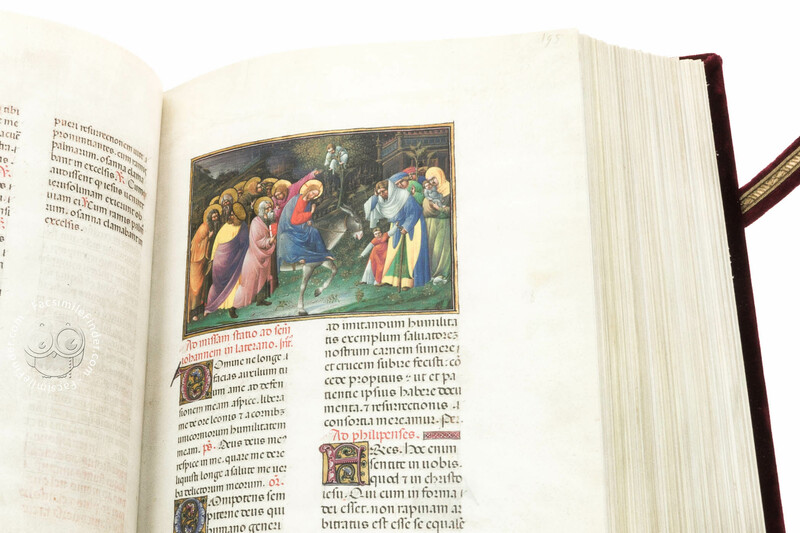 Work on the Missal began again thanks to Barbara of Brandenburg-Gonzaga, who in 1459 took over management of the production. 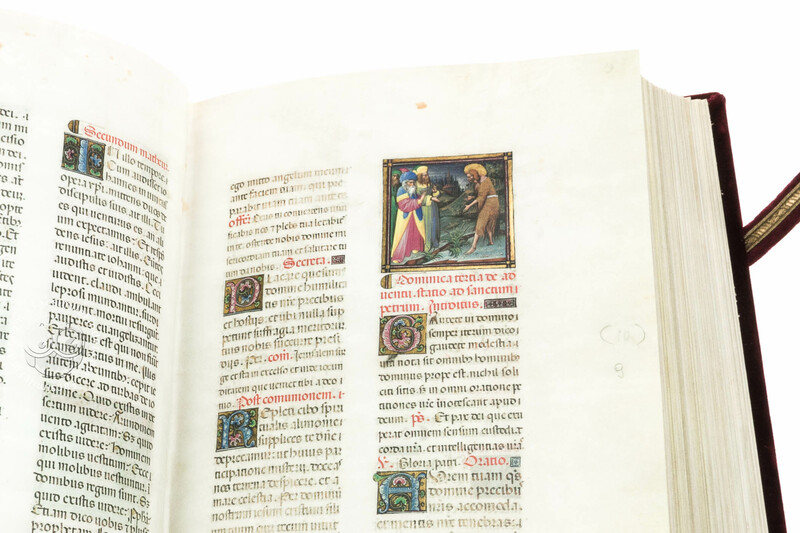 Andrea Mantegna recommended the name of the illuminator to Barbara. 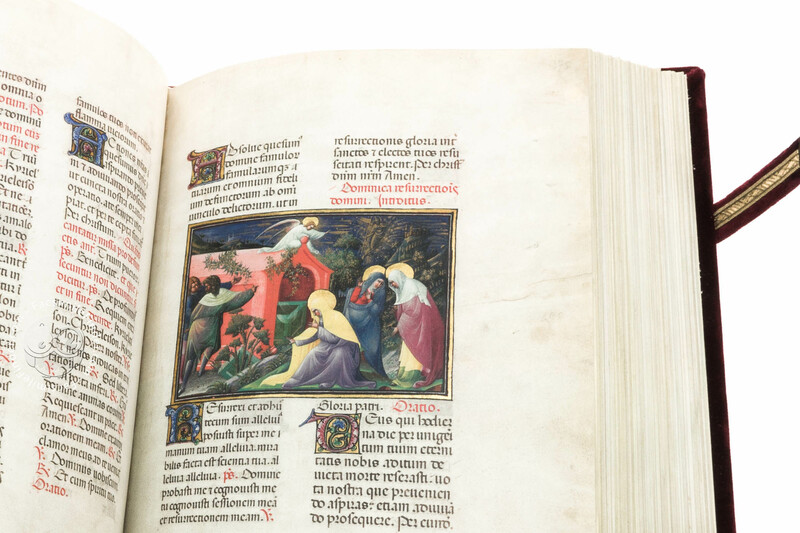 The artist who would bring the work to its conclusion was the young Girolamo da Cremona, a follower of Mantegna, open to the new style elements of the Renaissance and already an expert disciple of Taddeo Crivelli, the artist of the Bible of Borso d’Este. 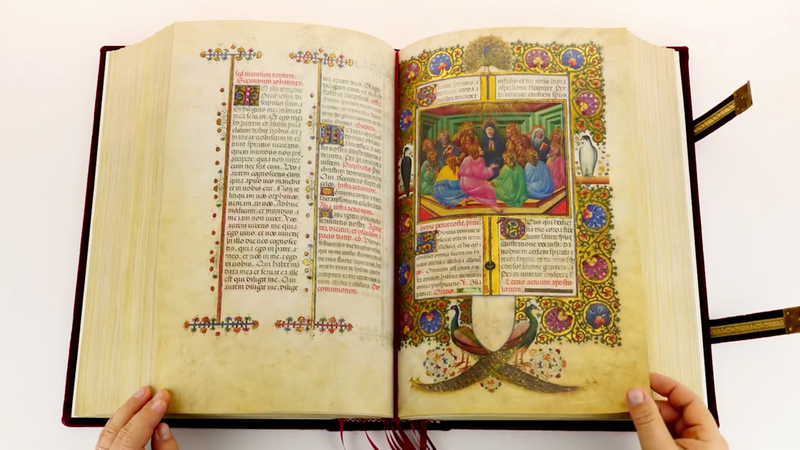 Since the earliest studies carried out on the Missal in the 1900s, the hand of a third miniaturist was evident. The artist remained anonymous, but it was most probably a collaborator of Mantegna and follower of the new styles of the moment brought to Ferrara by Rogier van der Weyden. 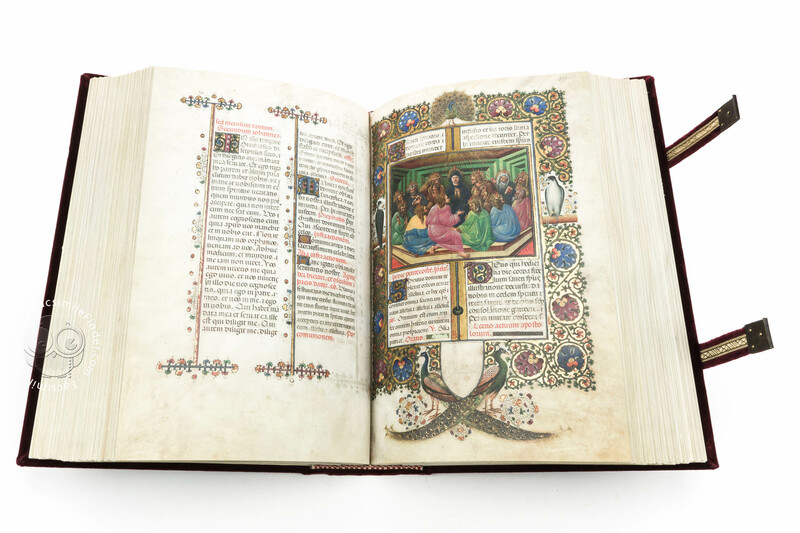 There are only three miniatures that can be attributed to this anonymous hand, which date back to around 1449-1450, probably commissioned by the Marquise Paola Malatesta. 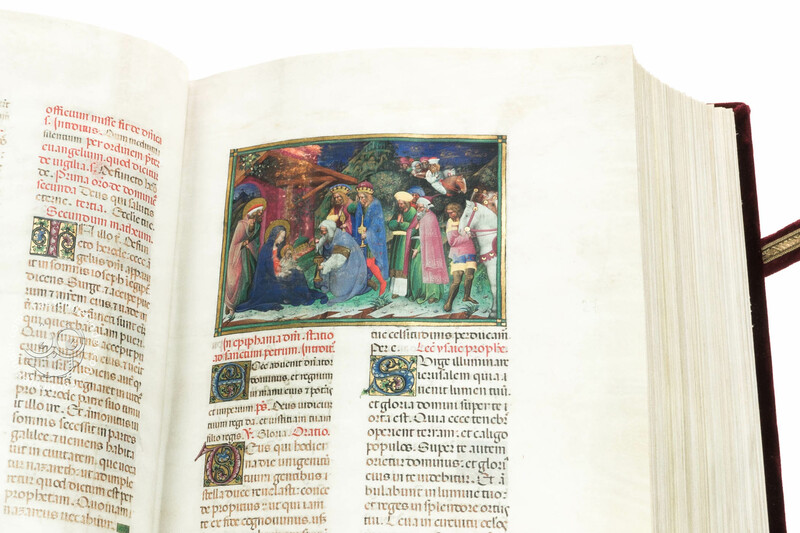 Among these miniatures there is the Adoration of the Shepherds (f. 18v), which clearly cites the contemporary Adoration by Andrea Mantegna, now on display at the Metropolitan Museum of Art in New York City. 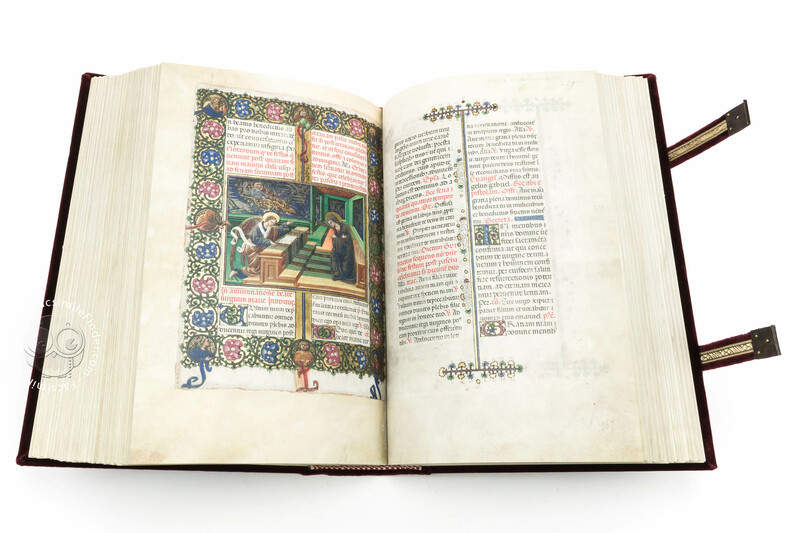 The Missal of Barbara, like all the Missals of the Late Middle Ages and the Renaissance, presents three diverse aspects through which it is possible to study the music that accompany its text. 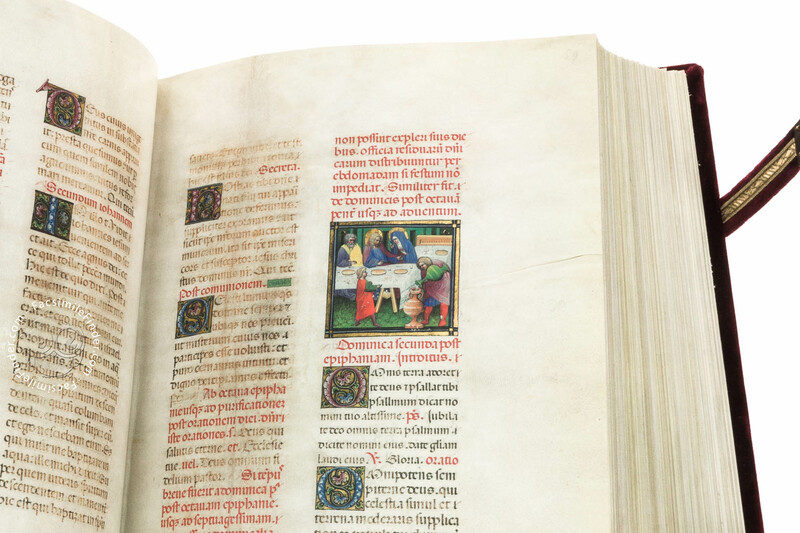 Firstly, there are parts of the text accompanied by musical notations; there is also a large collection of texts destined for songs, and finally there are the indices, which explain the process of the liturgical actions and help scholars to understand the musical practices of the time. 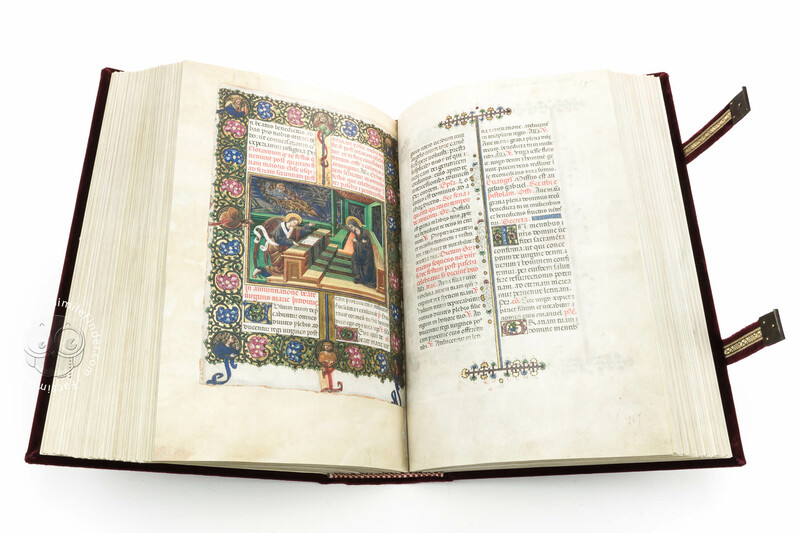 The Missal, located in the cathedral of Mantua, is an illuminated manuscript on parchment composed of 380 sheets (760 pages) measuring 39.5 × 26.2 cm. 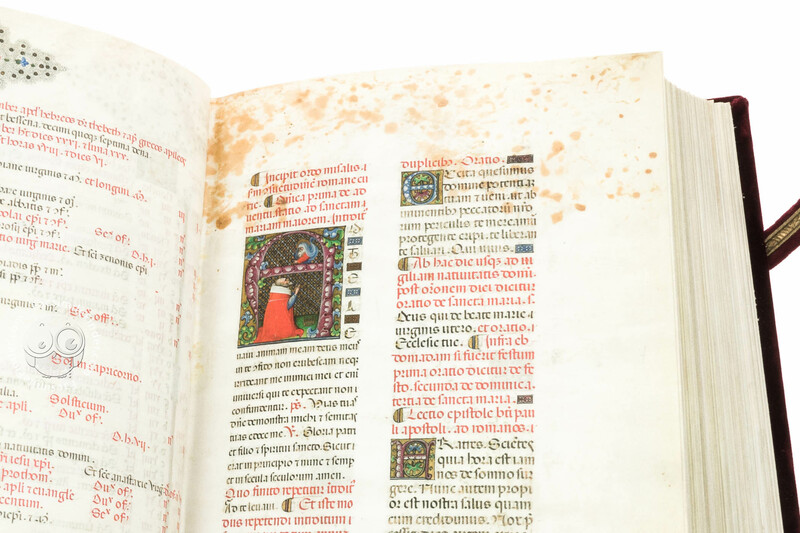 The liturgical text in Latin is written in semi-Gothic Italian with black ink, while the titles and indices are in red. For the musical accompaniment, the quadratic notation is black on red tetragram. 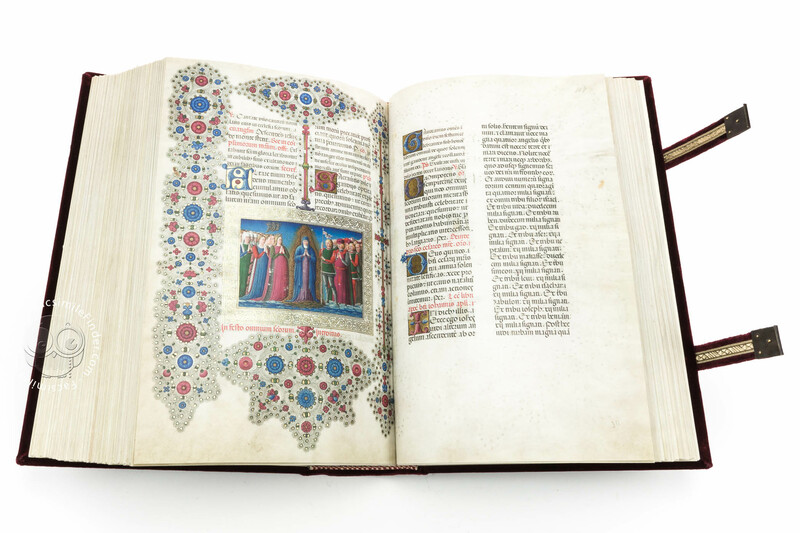 The decoration, embellished with gold and lapis lazuli, is structured as follows: 6 Calendar pages, with decorations on the outer side; 68 miniatures of different sizes; 2 large figurative initials; 7 pages with large decorations on four sides; over 2000 decorated initials; hundreds of paragraph initials with pen decorations. 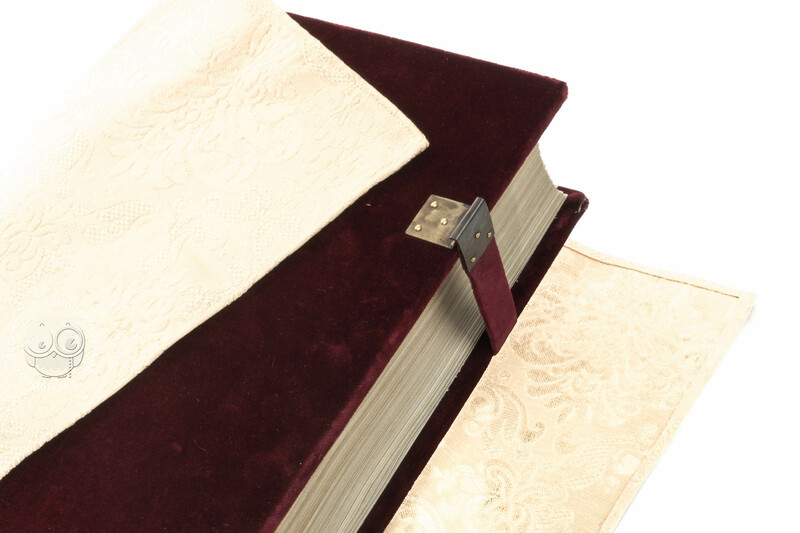 Manuscript book on parchment − 39.5 × 26.2 cm − 760 pp. 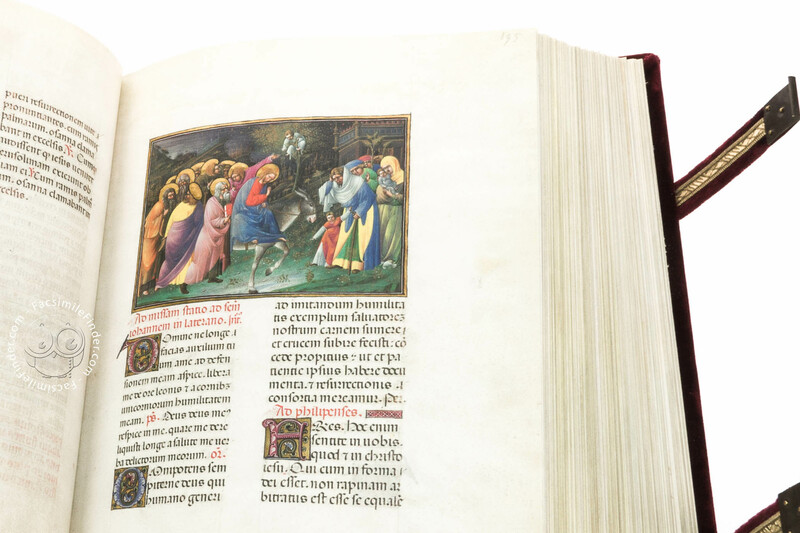 Commentary (Italian) by Zanichelli, Giuseppa Z.
Full-size color reproduction of the entire original document, Missal of Barbara of Brandenburg: the facsimile attempts to replicate the look-and-feel and physical features of the original document; pages are trimmed according to the original format; the binding might not be consistent with the current document binding. 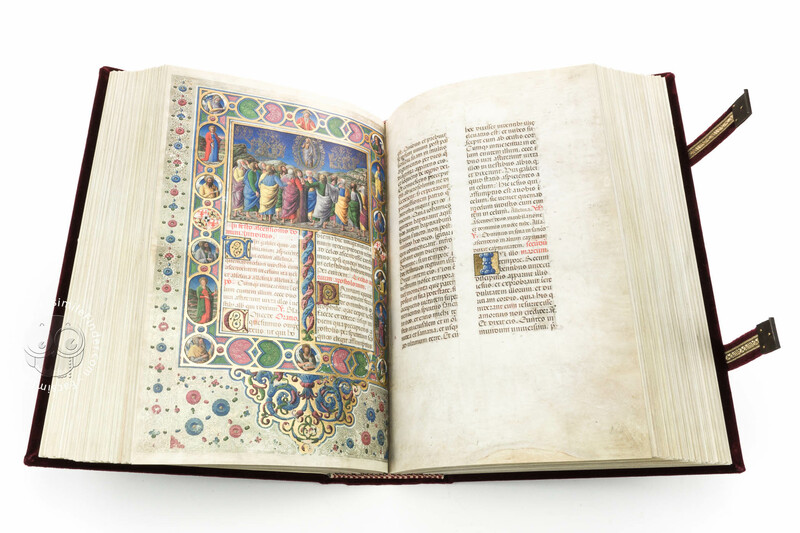 The facsimile edition is authorized by the Mantua Diocese and by the Regional Lombardy Superintendency. 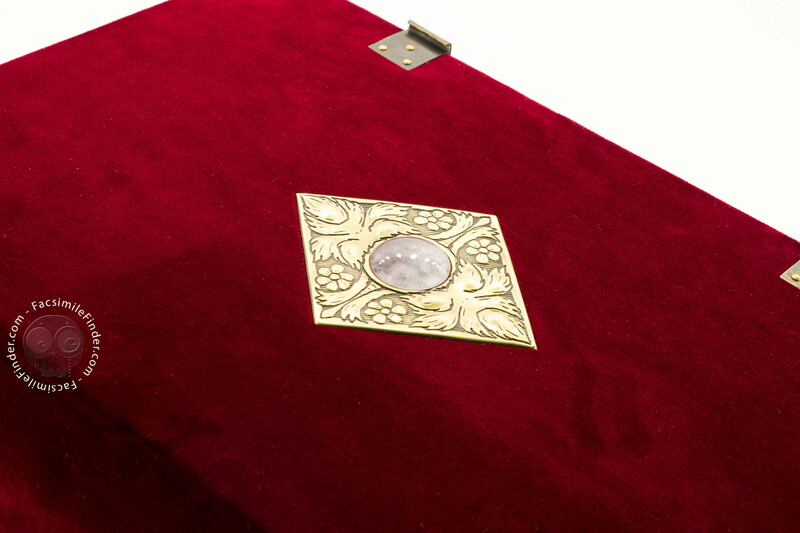 The piece is completed with the same red velvet binding as the original one kept in Mantua, created during recent restoration interventions. 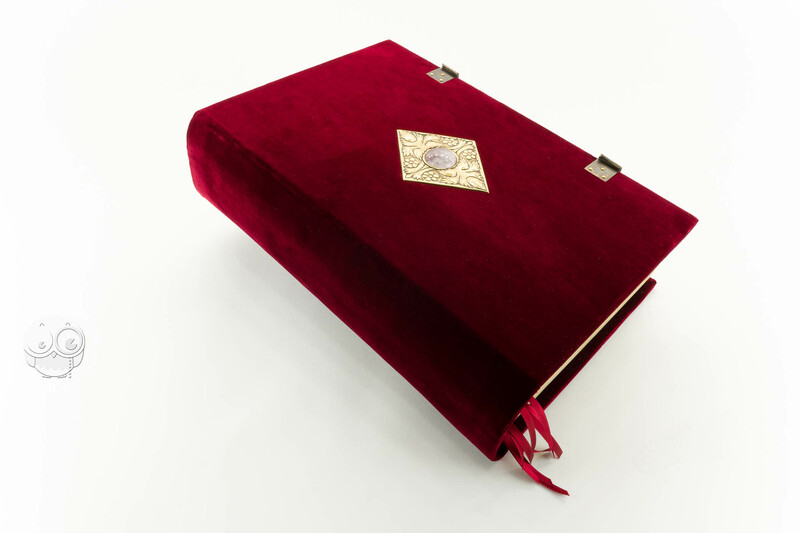 A special facsimile edition with decorated binding is also available (ask for additional information).